We love to hear what happens after our engagement rings leave our store, ready for the big moment. 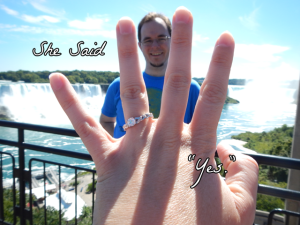 In the case of Ian and Jill, it happened at Niagara Falls! Being a small company, we like the fact we have one-on-one relationships with our customers and like to know that we’re a small part of a very big step in couples’ lives together. So send us your pictures and stay in touch! And congratulations to Ian and Jill! Check out our Facebook page for a picture of the happy couple.